The Department of Biology at MIT has been an incubator of unparalleled excellence for decades. It is considered by many to be the best in the world, and that recognition comes from the presence of extraordinary faculty who, in turn, attract outstanding graduates from both MIT and other schools. These students have gone on to build our nation’s science and technology enterprises by doing groundbreaking research, spawning new companies, developing life-saving medicines, and providing high-level government service. Many of the new institutes that have sprung up across Kendall Square trace their roots to MIT’s Biology Department, from Professor David Baltimore and philanthropist Jack Whitehead’s creation of the Whitehead Institute in 1982, to Professor Eric Lander’s teaming with Eli and Edythe Broad to create the Broad Institute in 2003. The Koch, Picower, and McGovern Institutes have also sprung up with the help of the department. Companies ranging from small startups to global pharmaceuticals have opened their doors in Cambridge to take advantage of the local talent. 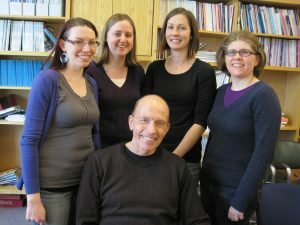 Paul Schimmel Ph.D. ’67 (VII), MacArthur Professor Emeritus, was a member of the faculty in the Department of Biology for 30 years and was involved in starting several companies. According to his former student, Eric Schmidt Ph.D. ’96 (VII D), “Paul always exhibited a keen interest in translating biomedical innovation to the commercial setting, and beginning in the 1980s he became one of biotech’s few serial academic entrepreneurs. Somehow, despite any formal training in business, Paul was able to start multiple, highly successful companies.” Local Cambridge companies with Schimmel’s imprimatur include RepliGen, Alkermes, Cubist, and Alnylam, among several others in San Diego and Seattle. As a member of the Biology Visiting Committee, Schimmel has seen firsthand the decline in federal funding and its impact on the department. Federal support, specifically for training graduate students, has steadily declined. Exacerbating the problem is the fact that the costs of research and training increase every year. According to Department Head Alan Grossman, the department has historically relied extensively on government funds to train its students and to support research. According to Grossman, “The country’s life science enterprise is built on the foundation of basic research and our understanding of how living systems function. In order to understand, cure, and prevent disease, we need to know about the non-disease state.